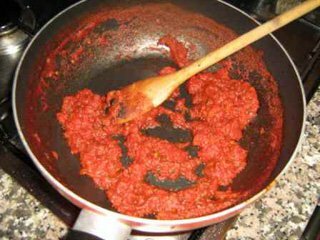 Tomato paste, originated from tomato purée is a thick paste that is made by cooking tomatoes for several hours to reduce moisture, straining them to remove the seeds and skin, and cooking them again to reduce them to a thick, rich concentrate. Add salt and stir continuously until condensed, no water shall remain in the sauce. 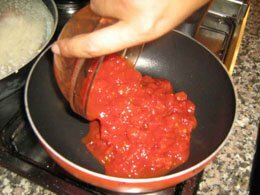 This is the concentrated tomato paste.